Many IELTS candidates shake in fear when a Match Headings task appears on their test paper. Really, you should rejoice! With our simple method and a bit of practice, this task can become a breeze. If you’re preparing for computer-delivered IELTS, check out our video on YouTube to see how Match Headings works. Basically you need to drag and drop the heading above the correct paragraph. Regardless of how you are taking the IELTS, the same strategy applies to match – and it’s shockingly simple! In this question type, you should start with the text, not the questions. The idea is to read a paragraph – usually paragraph A first – and decide for yourself what it’s about. Imagine you had to describe the paragraph to someone who hadn’t read it. And that description should be as short as possible. This is a form of paraphrasing. By doing this first, you are forcing yourself to read slowly enough to understand the main idea of the paragraph. Remember that this question type is not asking you to locate details but rather to grasp the main points. Once you’ve read the paragraph and got your own idea of what it’s about, then go to the list of headings and read them. Read. Every. Heading. In. Order! Resist the temptation to jump back and forth from heading to paragraph to heading to next paragraph etc etc. This is a recipe for disaster – and a huge waste of time. If you spend that time reading through each heading carefully, by the time you get to paragraph D, E, F, you’ve probably memorised the headings and you’ll be able to find the correct one much faster. For paragraphs A and B, be strict with yourself. Read the paragraph once only, then read all the headings, top to bottom. As you read each heading, ask yourself, “Was the paragraph about this?” If you read carefully enough, you should be able to answer, “Yes,” “No” or, if it’s a tough question, “Maybe.” If you’ve got 2 “Maybes”, then just write both down and come back when you’ve answered all the other questions; it will usually be clear by then. Beware of choosing a heading which contains the same vocabulary as the paragraph. This is usually a trap! Step back from the details and think about the paragraph holistically. Attempt our practice questions below and see how you go. Then practice with IELTS expert, Alex and check out our YouTube clip at the bottom of the page. 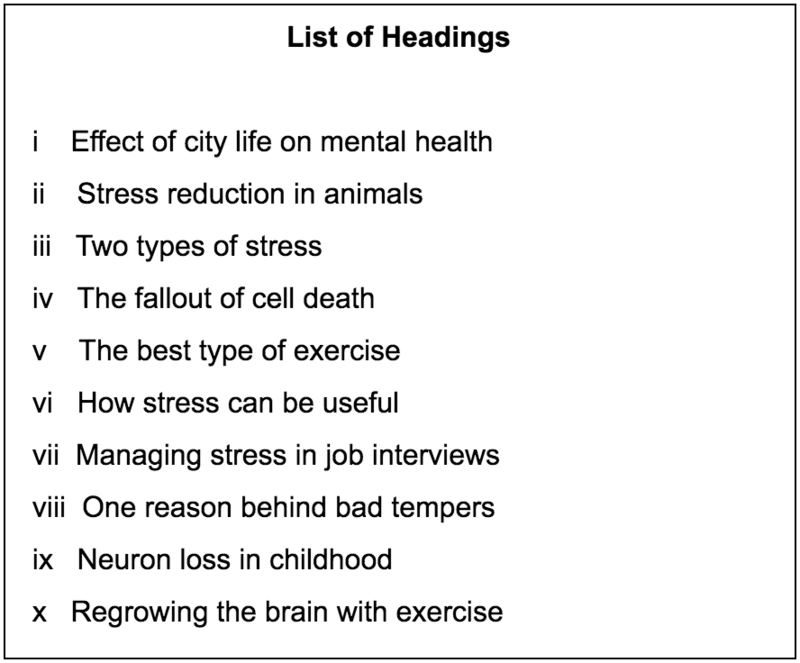 Choose the correct heading for paragraphs A-E from the list of headings below. Write the correct number, i-x, in boxes 1-5. Despite its bad reputation, stress historically had a vital role to play. Commonly referred to as the ‘fight or flight’ mode, the sudden release of stress hormones like adrenalin and cortisol causes the heart to beat faster, airways to dilate and blood vessels to open up, all of which push the body towards optimal performance and, ultimately, survival. In the rest of the animal kingdom, this is still often the difference between life and death. As he springs off to freedom, the lucky gazelle who escapes the lion can thank this primal evolutionary response. In ordinary modern life, although we’re in little danger of being stalked by wild beasts down city streets, our bodies react to stress in the same ways. 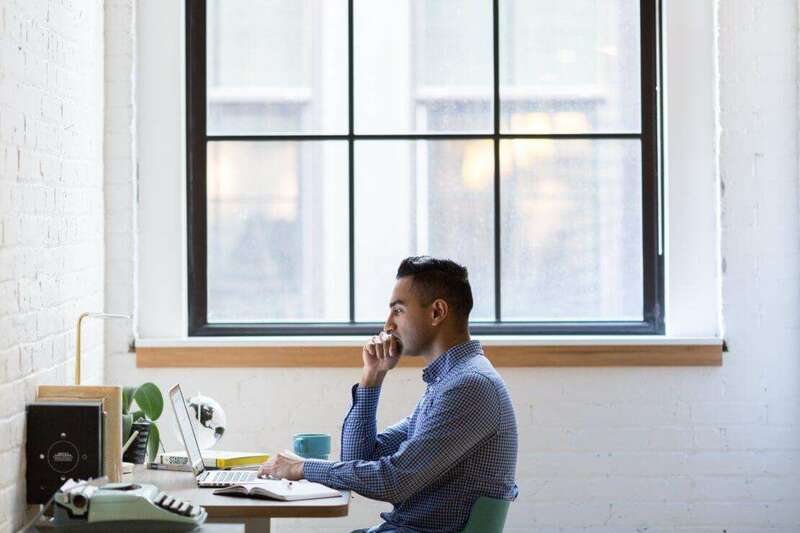 Experiencing anxiety, fear and stress is considered a normal part of life when it is occasional and temporary, such as feeling anxious and stressed before an exam or a job interview. It is when these acute reactions are prolonged or cannot be switched off, however, that serious physical, social and cognitive issues can result. In contrast to the normal everyday stress of modern life, chronic stress is a pathological state which can significantly interfere with daily living activities such as work, school and relationships, wreaking havoc on the body’s immune, metabolic and cardiovascular systems. Of major concern is the impact on the brain. Researchers have found that the hippocampus, the control centre of memory and our ability to learn, can physically shrink in response to prolonged release of stress hormones like cortisol which result from chronic stress. Neurons in this area do not just get smaller, but actually die, which weakens the neural connections, affecting the way memories are organised and stored in the brain. A chronically stressed person would recognise this as a ‘brain fog’, and it also has ramifications for other areas such as creativity and adaptability. While this part of the brain gets smaller, another area, the amygdala, which is involved in processing emotions, can grow with chronic stress. Across species, a larger amygdala has been found to correlate with aggression and this, coupled with the weakened connection to the prefrontal cortex, the brain’s decision-making centre, can profoundly impact mood and behaviour. With the link between emotions and decision-making compromised, a person is much less able to stop and reflect, becoming instead reactive and short-fused. Think of the difference between being able to tolerate a screaming child and instead giving in to the desire to scream back. In the past, it was accepted that there was a limited number of neurons in the brain and as they died off as a result of ageing, stress or substance abuse, for instance, they were lost forever. It turns out, however, that this is not the case and that stem cells within the brain are actually able to create new neurons. In other words, lost neurons can be replaced. What makes this discovery even more powerful is the fact that replenishing neurons is rather straightforward. One of the most powerful stimulants for neuron growth is physical activity. So, in addition to its role in the reduction of stress hormones in the first place, and its ability to stimulate the release of endorphins, exercise has now been shown to contribute to the repair of the chronically stressed brain. To practice more, sign up at www.E2Language.com where you find a whole section devoted to the Match Headings task type. And be sure to come along to our Live Classes to work under time pressure with your teachers. Do you offer checking the task2 and give feedback. I need guidance for my writing section. If so then how much do you charge for it? Unfortunately we do not offer our services ‘a-la-carte’- instead we provide preparation packages to help our students prepare.